slip house. | owl's house london. An apt successor to the concrete-and-pink gallery house of my previous post, Slip House comprises ‘a simple, sculptural form of three cantilevered boxes (or slipped) boxes’. The shifting planes break up the bulk of the building, adding to this sculptural quality. Largely constructed from glass, steel and concrete, these raw materials are evident inside and out. This is architecture in its raw form, designed by an architect as his own home. 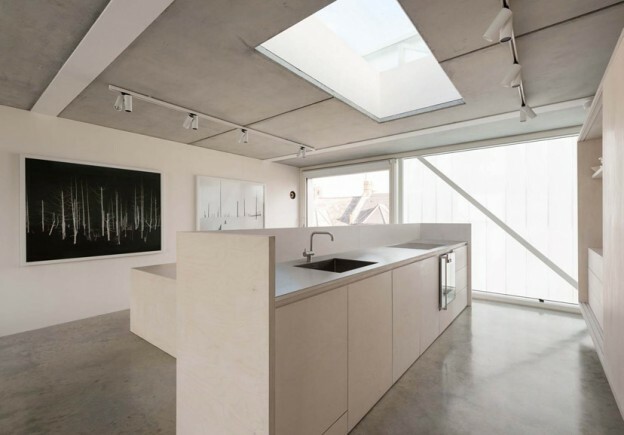 It was also an RIBA award winner – best house in the UK for 2013. It is also nobly eco friendly, sustainable and energy efficient with triple glazing, solar panels and wildflower roofs all contributing to its performance. The house is arranged over three floors with a large roof garden on top. 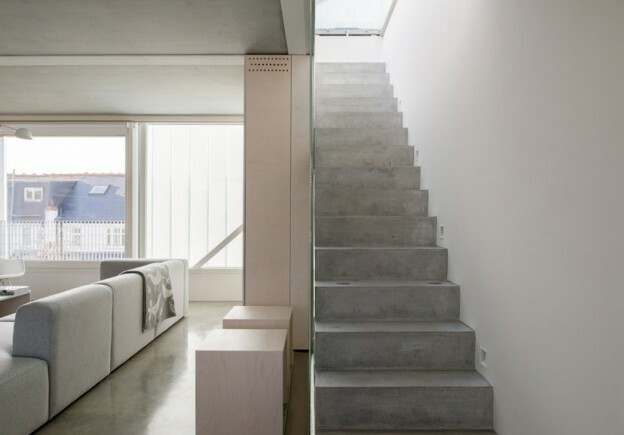 Full-height glazing at either end together with an open plan layout (the perimeter walls carry the load) allow the light into the centre; necessary in an infill site with neighbouring terraces in close proximity. 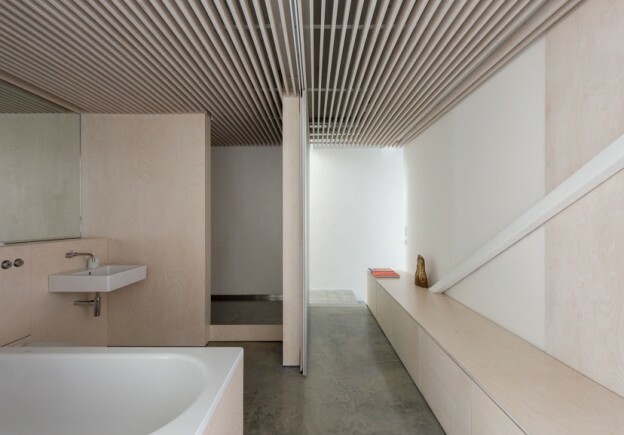 It has the requisite architectural details – shadow gap at the junctions between vertical and horizontal surfaces, and where elements of different materials conjoin. 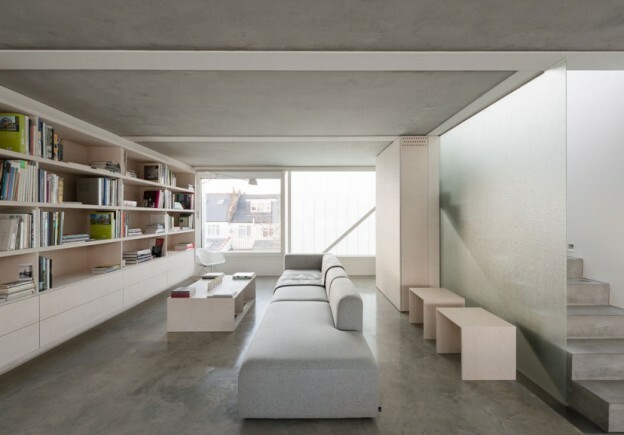 It is minimal in its use of materials and finishes, with an utterly retrained palette. Could you live here? It’s marvellously accomplished, but personally I find the purity a little relentless. I’m also not keen on the pinkish hue of the birch plywood, seen on much of the bespoke joinery, as it sits alongside the dull grey of the exposed concrete. I’d have to add some disharmony – lots of textures, some colour. This entry was posted in wonderful spaces. 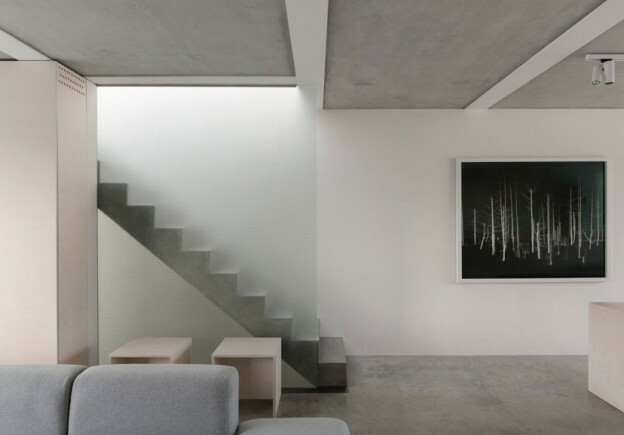 and tagged architecture, Carl Turner, concrete, glass, minimal, RIBA Manser Medal, Slip House on February 19, 2014 by owls house london..
Love the light, open space…. But feel it is still a blank canvas, like you would like to see some colour and texture. i have a suspicion the architect owner probably lives in this almost monastic environment..! ha! throw restraint out of the door… actually wouldn’t it look amazing in bold primary colours?! look when I geet home. I’m amazed at how quick your blog loaded on myy mobile ..